If the history of United States federal budgets — and the debts that grow out of them — tells us anything, it is this: The dollar’s in it up to its eyeballs. Today’s level of debt and continuing deficit spending is only the visible portion of that problem; beneath the surface we face an unavoidable day of reckoning for our great national pastime: spending money. Since long before Lord Keynes opened his mouth in the 1930s, the attitude in Washington and among academics has been that we don’t really have to ever repay debt. It can be carried indefinitely for future generations to worry about. Most today would claim that debt doesn’t matter or even that it is a wise policy to spend more than you bring in. The mind boggles. 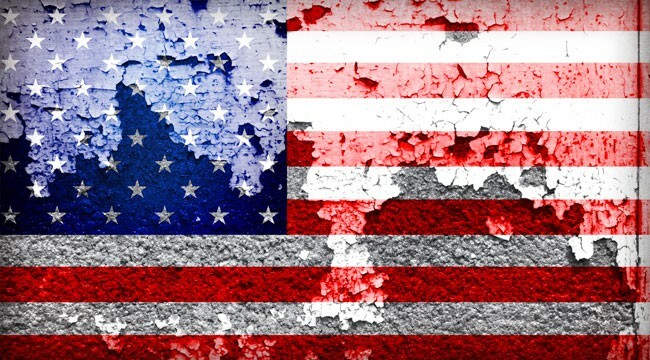 Early on in U.S. history, we Americans learned from our British ancestors that empires could be built on a foundation of debt — and continued indefinitely. In the early part of the eighteenth century, Sir Robert Walpole introduced an innovative system for financing Britain’s colonial expansion and ever-growing military might. Government, Walpole demonstrated, is able to create a revenue stream by issuing bonds and other instruments. The interest is paid regularly, and eventually, upon maturity, the face value is paid off — and for every maturing bond, a new one is issued. This simple method for the expansion of revenue through debt was the venue by which Britain built its empire, from the 1720s through the next 100 years. Among those who observed this phenomenon of endless debt financing was the first secretary of the Treasury of the United States, Alexander Hamilton. During the nineteenth century, American debt did not grow substantially. When Jefferson began his first presidential term in 1801, the nation had an $83 million debt, mostly left over from the costs of the war. During his two terms, Jefferson reduced the debt to $37 million even after spending $15 million on the Louisiana Purchase. In James Madison’s term of office, the ill-fated War of 1812 ran the national debt up to $127 million by 1816. James Monroe and John Quincy Adams were both able to reduce the debt during their terms of office, and by 1829 the debt had fallen to $58 million. And then, during Andrew Jackson’s presidency, the national debt entirely paid off. For the first time in its history (and the last) the United States had no national debt. Over the next decade, the country ran up $46 million new debt and by 1848 the national debt had risen to $63 million. However, in all fairness, one advantage of this was that the Mexican War resulted in U.S. expansion all the way to the Pacific and the acquisition of the entire Southwest, including California. Under the Franklin Pierce administration, the debt was paid down to $28 million; but it never got that low again. The Civil War exploded the national debt up to $2.8 billion, or 100 times higher than it had been in 1857. Debt in 1860 was $2 per capita; at the end of 1865, per capita debt was $75. The temporary tax measures in place during the war were repealed, and by the end of the nineteenth century the debt had been reduced to $1.2 billion, less than half of its 1865 level. Given the case expansion of U.S. territory and the wars the country fought to create and then hold together the United States, this does not seem large debt level. In fact, in its first 110 years, the United States had shown its ability to fund expansion while reducing debt over time. And this was accomplished without an income tax. In fact, in 1869 and again in 1895, the Supreme Court ruled federal income taxes unconstitutional. The story was quite different in the twentieth century. By the end of World War I, the national debt had risen to $26 billion. Even though the debt level had been reduced over the next decade, the Great Depression caused further deficit spending, and FDR’s New Deal Tripled debt levels up to $72 billion. World War II created yet higher debt levels. By 1945 the country owed $260 billion — small by today’s standards but gargantuan in its time. One outgrowth of that war was a new one, the Cold War. Military spending took the national debt up to $930 billion by 1980, and under Ronald Reagan’s administration it rose to nearly $2.7 trillion. In Bill Clinton’s eight years, the debt more than doubled to $5.6 trillion. And by the end of 2007, the debt had passed $9 trillion — a nearly tenfold increase since 1980. The debt almost doubled during George W. Bush’s eight years — from $5.7 trillion to $10.7 trillion. In other words, the national debt is growing exponentially. We may blame the War on Terror, the inheritance left by the Cold War, or the new international market and its competitive forces, or a combination of these realities. In any event, it is clear that the levels of debt keep setting new records, virtually on a month-to-month basis. [Ed. note.Back in 2005, we wrote, “The U.S. debt is growing at a rate of $1.4 billion a day, $1 million a minute; the most famous debt clock in the country, located on Times Square in New York City, will become obsolete once it hits the $10 trillion mark.” That figure seems so quaint now. Today, the growth rate of government debt is clocks in at $16,668 per second and over $60 million per hour. The total national debt exceeds $18 trillion and is 104% of the total economic output of the country for a single year. Whatever became of the debt clock in Time Square? The display ran “out of digits when the U.S. gross federal debt rose above $10 trillion on Sept. 30, 2008,” reads the Wikipedia citation on the clock, “An overhaul or complete replacement adding two more digits to the clock’s display is currently being planned.” Apparently, even those maintaining the clock have lost any urgency on the matter. I love the following comments, issued in a joint October 2007 statement by Henry Paulson, then secretary of the U.S. Treasury, and Jim Nussle, then director of the Office of Management and Budget under George W. Bush. True, but: We still have a deficit. In reviewing all of this history, we make a distinction between debt levels and deficit spending. Many people are still confused about the differences, and some, even experts, use debt and deficit interchangeably. A debt is the amount of money owed. A deficit is the shortfall in a current budget. For example, if we begin the year in with a $6 trillion national debt, and during the year we spend $1 trillion more than we bring in, we are running a deficit of $1 trillion. By the end of the year, that deficit will have increased the debt to $7 trillion…. 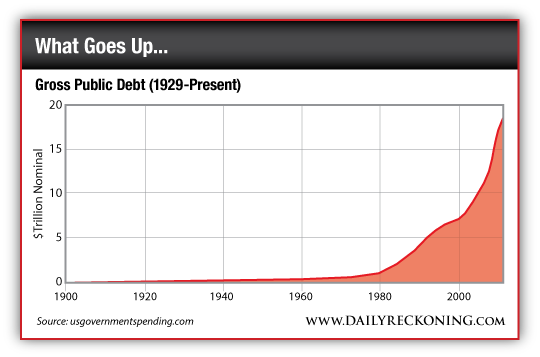 Hence our forward progress, today, to a total national debt of $18 trillion and beyond. Fun facts for your weekend: If you broke down the debt as of today, Friday, Feb. 13, 2015, into $1 bills, you could wrap them around the Earth 70,585 times. Stack them on top of each other and you would make a pile 1.2 million miles high… the equivalent of five lunar flights to the moon. Of course, we don’t use paper for our paper money anymore. Only electronic digits. What you can’t see… can’t hurt you, right? Riiiight.